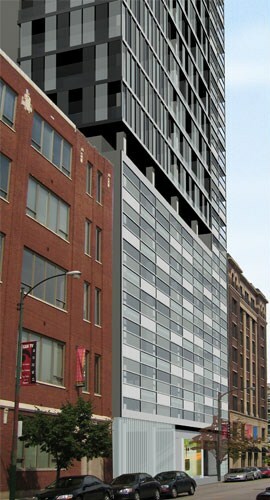 Brininstool, Kerwin and Lynch with plans for a high rise in Chicago’s West Loop/Greektown! 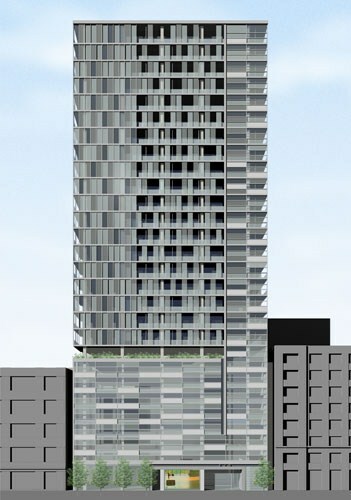 Just caught these plans for a new residential high rise building on the real estate message board, Skyscraperpage. 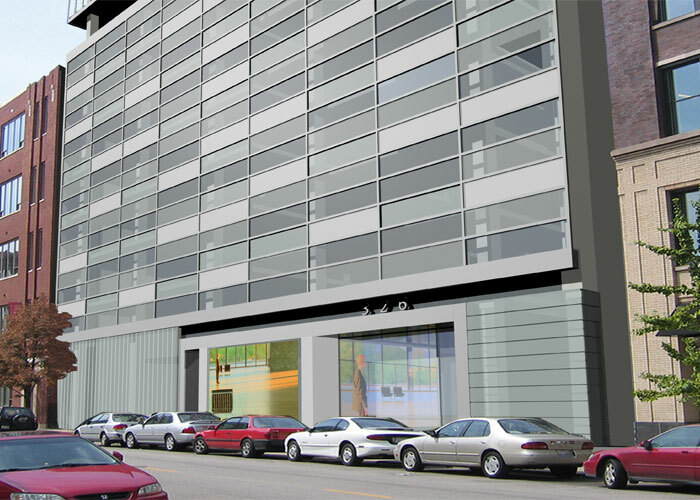 The proposed building, designed by Brininstool, Kerwin and Lynch, will replace one of the many parking lots in Chicago’s West Loop and Greektown neighborhoods on Green Street between Van Buren and Jackson. The Brininstool, Kerwin and Lynch website describes the building as having around 370,000 square feet in 28 story’s, eight of which will be above ground parking clad in glazed horizontal windows. With the current plans, I’m definitely on the road to really liking the building. The base from far away actually looks pretty interesting but once you see a close up photo, my opinion goes a complete 180… It just looks so boring and sterile especially when it’s surrounded by dozens of old, detailed, brick buildings. Please come up with something better! Check out the Brininstool, Kerwin and Lynch website for information on the firm and their other projects! The construction of new retail hits a 25 year low. Sure this sounds really doom and gloom but when you think of it, this was bound to happen, it just took a bit longer to happen than the housing fallout. Industrial, commercial, retail, and residential sectors don’t all fall or reach a low at the exact same time but just like the residential market, the retail market will get better soon. Not sure about you, but I still see stores and restaurants packed full of people spending money so I’m not too worried. (Crain’s) — The construction of new shopping centers in the Chicago area continued to grind down in 2009, falling to its lowest level in a quarter century. Retail construction dropped plunged 53% in 2009, to 1.7 million square feet, compared to 3.7 million square feet in 2008, according to an annual report by retail real estate brokerage Mid-America Real Estate Corp.Last year’s total was the lowest since 1984, when 1.6 million square feet of retail properties were completed. In 2011, the pace of development will rise only “marginally,” he says. “It’s perhaps the new normal for the foreseeable future,” he says. City of Chicago Property Tax Relief Program. Check it out! I completely forgot where I saw this flier but I know that I saved it for this exact reason. Check out the flier HERE! This tax relief program asks if you’re a homeowner who pays property taxes. Do you also make less than $200,000 a year? 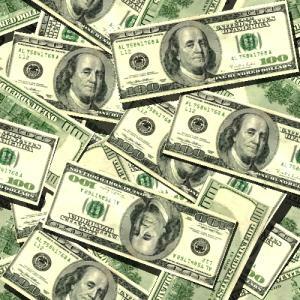 Then you may be eligible for tax relief of up to $200! To see if you qualify, just download an application at www.cityofchicago.org or visit one of the three locations! Again, click HERE! to view the pdf version of the tax relief flier. No matter how you think of it, an extra $200 is nice for anyone and after being taxed like no other, why not get something back, right? Chicago area home sales still going up. December a good month! Awesome news once again. Even though, in the end, 2009 as a whole was flat, I’m taking that as a win because we all know it could have been much worse…haha. 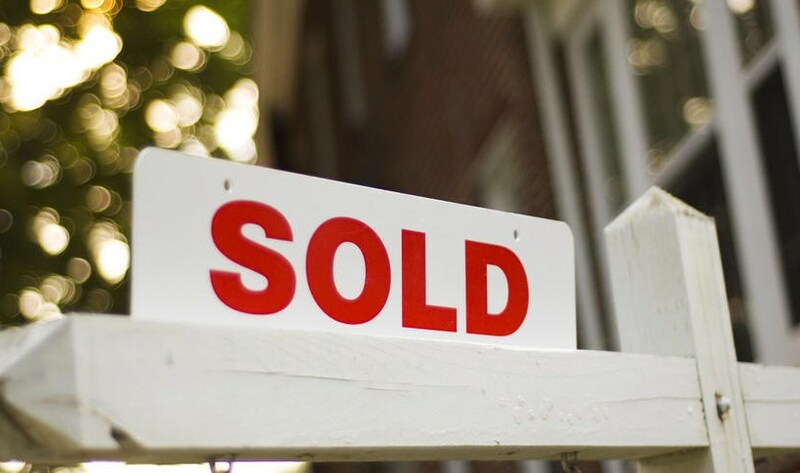 If you’re looking to buy a home, sell your current place, or even if you know someone who’s looking to rent a place, send me a message to my @properties email: jeffstewart@atproperties.com. (Crain’s) — Chicago-area home sales rose 33% in December compared with the same month last year and were essentially flat for the full year, according to the Illinois Assn. of Realtors. That’s a major improvement from 2008, when local sales fell almost 26% compared with 2007. The median price plunged last year in both the Chicago area and the city. The Chicago-area median — the price at which half the homes sell for more and half for less — dropped 18.3%, to $196,000, compared with 2008…. GREEN ROOF ALERT! 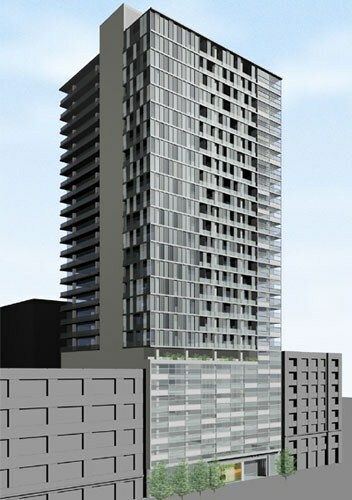 New 33 story residential buidling planned near Old Main Post Office! An investor team that includes two Bridgeport businessmen and a specialist in industrial cleanups is trying its luck with high-rise housing. They have proposed a 33-story building at 519 S. Clinton, just west of the vacant Old Main Post Office. It’s a poor market for planning a high-rise, so work won’t start anytime soon. But Langdon Neal, the investors’ zoning lawyer, said they wanted to start the approval process anyway. “They wanted to get the entitlement work done, so if the market does turn, they can take advantage,” Neal said. The investors include William Pacella and George Bonomo of Bridgeport. Pacella owns a trucking firm that won contracts under the city’s scandal-scarred Hired Truck program exposed by the Chicago Sun-Times. Bonomo owns a supplier of paper and cleaning supplies. They’ve invested together in race horses, and in the 1990s they tried to renovate the old Evans furrier building at 36 S. State, but couldn’t finance the deal. Another investor is Shadow Mirkhaef, an executive at GSG Consultants Inc., which handles industrial cleanups. Their proposal calls for 276 units of either rental or for-sale housing, depending on the market’s inclination, Neal said. Also included would be 327 parking spaces, a large allotment that would enable the site to provide parking for a Holiday Inn next door…. I’ve always wanted SOMETHING to be built on this side of the river and Congress. The land is soo close to the Loop and it’s being incredibly underutilized. This building looks great and should fit in nicely…not to mention the amazing green roof that’s planned for the building! I love green roofs! REALTOR® Magazine ranks Chicago as third smartest place to buy! I just got my weekly email update from REALTOR® Magazine where I found an article that had the Chicagoland area ranked as the third smartest area to buy a home. YES! Things are picking up like crazy lately. I’ve been insanely busy with showings and on the verge of some good things to come! If you’ve decided, or are having a hard time deciding to get into the market of buying, selling, or even renting, send me a quick email and I’m more than happy to help out or lend some advice. My @properties email is jeffstewart@atproperties.com. Here are the top 10 cities the magazine chose as the best places to buy right now. Full article HERE! 6 – Minneapolis-St. Paul-Bloomington, Minn.-Wis.
9 – San Francisco-Oakland-Fremont, Calif.